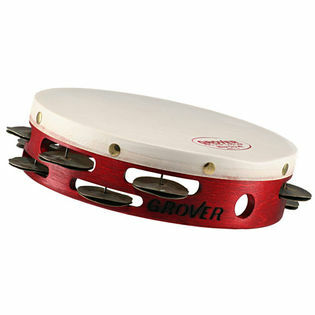 The Grover Pro Percussion T2/HTS-8 8" Double Row Tambourine features Heat-Treated Silver tambourine jingles, double mounted premium white skin head, captive pin system, staggered jingle slot configuration, solid hardwood shell, and reduced width grip. A free tambourine bag is also included. The Grover Pro Heat-Treated Silver tambourine resounds with a superb combination of bright, extra dry, and full sonorities. Percussionists who desire an articulate, "crunchy" spread of overtones will appreciate the extra steps Grover takes that crystallize the molecular structure of their German Silver alloy. The T2/HTS-8 Tambourine is perfect for passages that require exaggerated articulation. This is the ultimate tambourine for Carmen's Danse Boheme and Britten's Four Sea Interludes. I definitely give this tambourine 2 "thumb rolls up"! If your looking for a light and articulate tambourine this is definately the one to purchase. It reacts quickly and sounds amazing. Also it comes with a very good protective case for free. These tambourines are some of the best I have heard and played. They have a very dry, crunchy sound and are perfect for some of the softer orchestral excerpts including scheherazade, and britain's 4 seas. I wouldn't recommend it as the only tambourine that you own, but if you already have one, this is a great addition to your collection.